I really enjoyed The Ivy and was so excited to read Secrets. I love guilty reads like Gossip Girl and this series definitely falls under that. It is a fairly light read that is fun and realistic, with just a bit of depth. I love each of the characters even though a few are evil. the Callie is a very sweet character that you can't help rooting for, even though she doesn't do the the best thing most of the time, but seriously who doesn't make mistakes at times. Clint seems too perfect for a college boy and that makes me not want him at all. I love Gregory so much and find him sweet most of the time. I love her roommates so much and their unique personalities. I feel that the plot was better developed than The Ivy. There are so many secrets and scandals in this book that you will make you be wrapped up into every single plot line. I think that this story is very original, not many other Young Adult Series are about characters in college, which is exciting and realistic. I loved that the book faced issues that a lot of teens and even adults are facing it. The book addressed it at the end in a realistic, but amazing way. I think that this book is quick and addicting. 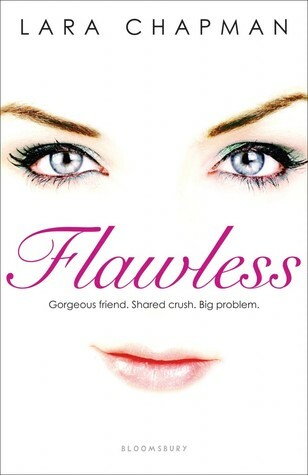 I would recommend this book to fans of Pretty Little Liars, Privates, and Gossip Girl. Kunze and Onur make a great duo and I can't wait to read more from them in the future. I adored her other books. So excited to read this one. For years, Regan's brother Liam has been nursing a secret. By day, he is Liam, a passably typical boy of his age; at night, he transforms himself into Luna, his true, female self. Regan loves and supports her brother and she keeps his Liam/Luna secret. Things change, though, when Luna decides to emerge from her cocoon. She begins dressing like a girl in public; first at the mall; then at school; then at home. Regan worries that her brother's transgender identity is threatening her own slippery hold on normalcy. This serious, powerful teen novel was a National Book Award finalist for Young People's Literature. This book sound really interesting. As she begins a very tough last semester of high school, Holland finds herself puzzled about her future and intrigued by a transfer student who wants to start a lesbigay club at school. Peters is coming to Seattle next week. I really liked this book when I read it. Tonight was so much worse than anything before it. Tonight he didn't stop after the first slap. At the beginning of senior year, Ann was a smiling, straight-A student and track star with friends and a future. Then she met a haunted young man named Connor. Only she can heal his emotional scars; only he could make her feel so loved — and needed. Ann can't recall the pivotal moment it all changed, when she surrendered everything to be with him, but by graduation, her life has become a dangerous high wire act. Just one mistake could trigger Connor's rage, a senseless storm of cruel words and violence damaging everything — and everyone — in its path. I have already read this book and it was epic. Really excited for this book. I loved her last books. Demonglass starts right after Hex Hall ended. There was just as much action and humor as Hex Hall had. Seriously I loved every moment of this book. Sophie seems a bit different in this book, but not in a bad way. It is like she has grown up a bit and gained some confidence in what has happened in the last book. I love Cal. He is so smart and selfless and he would do anything for love. While Archer's character seemed somewhat arrogant and over the top at times. It seemed overly dramatic, whenever he appeared. I definitely preferred Cal, over Archer. Hawkins' characters are complex and not exactly as they seem, which makes them even more believable. Hawkins' writing is exciting and enjoyable. Demonglass is a quick read, as is the prequel Hex Hall. If you want a book with a hint of romance, mystery, humor and paranormal combined in one book with lovable characters and a gripping plot. This is the perfect series for you. Abandon was all about setting up a series perfectly for the next few books. As result, Abandon dragged a few times and the story wasn't that confusing, even though it was constantly going back and forth between the past and the present. I didn't like that most of the story was hinted too and then later explained. It made it hard to understand Pierce at times and I didn't feel liked I connected to her. I also never felt like the climax completely developed. John was really fascinating, dark, confusing, and secretive, even with all of this, I found him to be confusing, but rather intriguing. I think that there is a lot of originality in Abandon and I am excited to see what Cabot will write next. I definitely enjoyed this book and I am looking forward to Underworld. Hereafer by Tara Hudson sounds amazing and I have only heard great things about it. This book was absolutely adorable. Alexander captured the charm of Prosper County perfectly and had outstanding characters shine with such personality and spirit. Austin wants to fit in and thinks that FFA will help her find her place. Charles Dickens the Rooster had so much personality and jumped right off the page. Maribel is Austin's best friend and she is so hardworking and sweet. Sundi and Josh were great new friends to Austin and I liked their adoration for FFA and that they had more to their life then school and friends. Lewis was so funny and I loved the humor from being an Elvis Performance Artist. The plot of this book was adorable and I was engaged as I was reading this book. I read this book rather quickly. Alexander's writing was quirky fun and not like other contemporary books. I recommend this book to fans of Dairy Queen series by Catherine Gilbert Murdock. It was a fun, sweet, and overall adorable book. I admired Tansy's dedication to her grandfather and I liked that she was spirited. I just felt that she isolated herself from anyone and made herself the outsider. Even though she had a fear of being hurt, I felt that it wasn't very realistic at times. I really liked Bethyl Anne, she was very sure of herself. Even though she was younger, I felt that she was more mature then Tansy. Tate was a really sweet boy, but I don't feel that he was developed enough for me to have a good impression of him. This book was an original ghost story. I really enjoyed the insight to the past and that there was such rich detail in each scene. The pacing of the story was extremely slow and I wish that it didn't drag as much as it did. I liked that there was a hint of mystery and paranormal, but not to over powering. Archer's writing was beautiful, but I wish that the pacing was better and that I could relate to the character more, but the originality made it worth a read. The characters were all very different. Some were well developed and others seemed to stop halfway through the book. I really liked Kate, because she worked hard for what she wanted and didn't seem spoiled at all. Zara annoyed me till the end, because she didn't really think about anyone and was so selfish. She also didn't have any self discipline. Tommi, while being spoiled, at least wanted to make a plan for her future and wanted it to be in horses. The plot was interesting, even though I have never rode horses. I do know that the training and horse facts was accurate, because one of my friends showed them growing up. This is a fun series that I enjoyed and think that it will be prefect for teen fans of horses. In the past two years, Mclean Sweet has moved four times. At each stop, she assumes a new persona, but it never quite works. Whether she's an effervescent cheerleader or an intense drama queen, nothing can permanently dispel the turmoil and rage at her mother since her parents' divorce. Sarah Dessen's novel about a teenager and her restaurant manager father captures the vulnerability that young people often experience after the dissolution of their family. A compelling story; strong characterization; and with a touch of romance. Sarah Dessen writes amazing contemporary novels with awesome characters and an enjoyable plot. What Happen to Goodbye was just as amazing of her previous books and is my second favorite of her books. Mclean isn't sure exactly who she is and she has no clue what her place is in the world. Seriously who hasn't felt this way before? The truth is that everyone has at one time or another. Mclean also hasn't gotten close to anyone, since her parent's divorce, which is really sad. Dave was such a sweet guy and I seriously loved him. I liked that he had the boy next door feel and how sweet he was. The other cast in What Happened to Goodbye were cute and interesting and I couldn't help loving them. Dessen's writing style is remarkable. I know that her books will always cheer me up and captivate me into wanting to read more. This is definitely one of her best novels. I definitely recommend this book to fans of Sarah Dessen's previous novels and fans of contemporary fiction. I have been posting on Sarah's Random Musing for almost three years and I am excited to post my 1000th post. I started this blog when I was really sick and now I am going to college at Seattle University in September. I have changed so much in this time and made some of best friends because of this blog, which is well awesome. I also want to thank my followers, so I am having a contest for all of my awesome followers. Anyways, I am going to have a giveaway from now to May 31st. The winner will get a finish copy of Rosebush by Michele Jaffe, a signed copy of Shadow Walkers by Brent Hartinger, and a mystery ARC that I have read and I promise that it is amazing. Just fill out the form below to enter. I love the beach and beach reads seem to capture the sun on your skin, the sand between your toes, and the scent of the ocean. 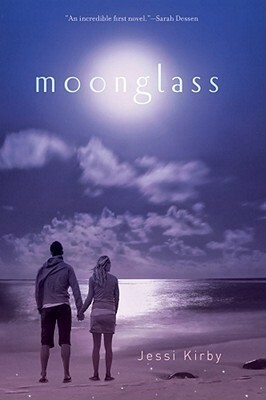 Moonglass had all of these feelings and more. The setting of Crystal Cove was a perfect setting. Anna was an awesome girl. She was very down to Earth and innocent. Unlike most young adult novels, she was still haunted by her mother's death and still hung out with her dad a lot, which meant that her parents were a huge part of the story. Tyler was so sweet and I adored him. He was unpredictable, which kept me guessing. I loved the mermaid mythology that was part of the plot. This plot was very intense, and I found myself to be engrossed through out the book. Kirby's writing was amazing. I loved the rich setting, intricate character, and a thrilling plot. It was definitely an amazing debut. This book is a must read for fans of Sarah Dessen, Sarah Ockler, and Melissa Walker. It is a perfect beach read! OyMG was such a funny book. Every single page made me crack up and laugh so much. The characters were so realistic and well developed that I couldn't help loving the story. Ellie was full of so much energy and spirit. I loved the determination that she had to get what she wanted. Devon was so sweet and I adore him. I loved the attraction between Devon and Ellie. Zeydeh made me laugh a lot and I loved the strength and optimism that he had. 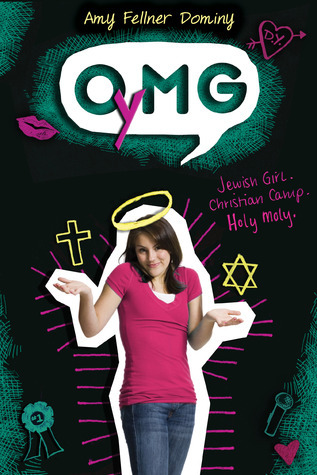 The plot of this book is more complex then just a Jewish girl going to a Christian camp. It has a lot of depth about religion and choosing between what is right and what isn't. It also deals with expectation and finding what you believe in. The concept of the story isn't the most detailed or exactly fresh, but Dominy's approach was unique and very inspiring. Dominy's debut was stunning and I can't wait to see what she will write next. OyMG is a coming of age story that I am sure everyone will be able to relate to. I highly recommend this book. I wasn't a huge fan of Shade, but I loved the concept of the book and was excited for what would come up next in the sequel. Luckily, it surprised me and I really liked this book. Aura is very strong willed and I loved the determination that she has at times. I hate how she constantly wavers at what she wants and is extremely indecisive. The fact that she would randomly angst out at times was annoying, but I still enjoyed this book. Other then Logan and Zachary, there was a third love interest, which kind of came out of nowhere. I love Zachary. He is sweet most of the time and completely cares about Aura. I loved how strong their relationship was. Logan was so selfish and I still didn't like him. The backstory to Aura's mom was really fascinating and I loved that was included. The plot of Shift was really exciting. There were a lot of twist in the book that kept me on edge. The concept is really unique and Smith kept on developing the plot into a breathtaking story. Smith is a stunning writer. I recommend this book to fans of Shade. If you like Shade, you will love Shift. There are so many complexities in this book that will keep you entertained with complex characters and a thrilling plot. Today, I have Brent Hartinger. He is the author of Geography Club, The Last Chance, Texaco, The Order of the Poison Oak, Grand & Humble, Split Screen: Attack of the Soul-Sucking Brain Zombies/Bride of the Soul-Sucking Brain Zombies, Dreamquest, Project Sweet Life, and his newest book Shadow Walker has just been released. He is also a fellow Washingtonian, so I hope you enjoy his post and check out his books. 9. The World of Indiana Jones. The real 1930s and the real Nazis? Not so much. But I’ll take the Lucas/Spielberg fantasy recreation of a world where magic is real and everything is really, really fast-paced and exciting. 8. Westeros (and Essos): Have you read George R.R. Martin’s A Song of Fire and Ice? If not, you’re missing one of the most interesting, and most realistic, fantasy realms ever created. 7. Willy Wonka’s Chocolate Factory. Okay, maybe this isn’t a fantasy “realm” per se, but I’m still so there! What I’m interested in are all the candy rooms they didn’t visit, and all the Great Glass Elevator buttons they didn’t push. 6. The Realms in The Gemma Doyle Trilogy. I don’t particularly want to visit the effectively creepy fairy world in this gothic homage series, but it sure was well done. 5. Earthsea. One of the most perfectly realized fictional worlds of all time. I totally believe it exists! 4. Sunnydale. I really only want to visit to get to know Tara and Willow, who would totally be my BFFs. 3. Ancient Greece (in the world of Xena: Warrior Princess): I like my fantasy realms with a dash a camp and strong sense of humor, which Xena definitely had. Plus, it looks a lot like New Zealand. 2. Middle Earth. Most people want to go to heaven when they die. Me, I want to go to the House of Elrond. 1. Narnia. Yes, it was between this and Middle Earth, but asked himself: which would I rather visit? And the answer is obvious. Less grit in Narnia, with fewer orcs and more Father Christmas and giant owls. I love Elizabeth Scott. Her books are always fantastic and surprise me in someway. Between Here and Forever was definitely amazing. Abby feels that she can't measure up to her sister, but I think that everyone feels that way about someone that they won't ever be as pretty or smart enough. She would do anything in order to wake up her sister and I adored her dedication to her sister. It was similar to what I would do for my sisters. She thinks that no one can see past Tess, but the whole time she was wrong. Tess had secrets that were uncovered and I found it sad that the person that Abby knew was not the person that she was. Eli was so sweet and he liked Abby so much. The character were so believable and relatable that I couldn't help loving it. The plot of this story was spectacular. Every moment of the story was beautifully written. Elizabeth Scott has such a raw and intense prose that makes a story so intense and realistic every moment. I would definitely recommend this book to fans of contemporary fiction and Elizabeth Scott's previous books. It comes out on May 24th. Charlotte is a normal girl that is full of principles. She isn't super smart and kind of feels out of place at her new high school. I liked that she didn't give into peer pressure really easily and had plenty of flaws. Amanda was kind or everything that Charlotte wanted to be and they quickly became friends. I didn't feel that she was great to Charlotte at times. I never really trusted Neal, because of the fact that he wanted to keep the relationship a secret, but I still swooned along with Charlotte. I really love her family. Her father was a famous author, her mom was really caring and a professor, and her little brother was really smart. The plot of Girl Wonder kept me guessing the whole time. There were so many twist and turns that kept me guessing. I loved that it was all centered near or in Seattle. It was a fast read that kept me wanting to read more. Girl Wonder was full of so many surprises that made me love this book so much. I love Realistic fiction, and Alexa Martin's debut captured high school so well in in Girl Wonder. There are books that everyone needs to read in their lifetime and I think that Divergent is definitely one of them. I had heard so much hype about Divergent that I was really excited when I got it for review, but at the same time, I was not sure if I would love it, but I do. It has such a stunning premise. There are five factions, which are: Candor which embodies honesty, Abnegation who are selfless, Dauntless who are brave, Amity who are Peaceful, and Erudite who want intelligence. When you are 16, you are given a test that helps you decide which faction you should be in. I think that is a really unique and amazing concept that I loved. Tris is very easy to like and connect with. She was intelligent, spunky, and really nice. I loved Al and Christina. They were such great friends to Tris and really cared about what happened to her. Four was so amazing and I totally love him. He is such a sweet and strong character. All of the characters were well developed and lovely. I couldn't help caring about each character a lot and I felt so invested that some parts were hard to read. There was so much action in Divergent. Every part of the book was intense and surprising. I could not put this book down and finished it in one or two sittings. Roth reinvents Chicago and takes us into a gripping and unforgettable world that is full of surprises, betrayal, and just plain awesomeness. Divergent is an amazing debut that will appeal to fans of The Hunger Games, Delirium, and many other dystopian novels. I can't wait for more from Roth in the future. Seriously buy this book now! I really wanted to like this book, but I just couldn't. I didn't feel that I could connect to any of the characters. Micheal was written as a professional victim that never stood up for himself or had any responsibility for what happened. It just annoyed the hell out of me. Ciaran was pissed off, if he didn't get his way, which was a lot. The villain of this book was way over the top and more made me laugh then anything else. The plot seemed to be over complicated and the style that it was written didn't work for me. The POV switched within a paragraph and I would have to reread something two to three times to get the point. The head jump was too much for me to handle. I will give this book, some points for originality in the premise... mermaid vampires, anyone? The mythology in this world was interesting, but wasn't enough to redeem this book for me. Other reviewers have liked this book, so I recommend checking out their reviews before making a decision.